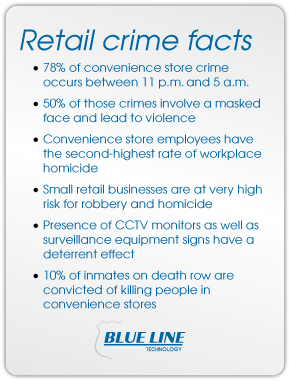 Retailers have one of the highest risks of workplace homicide of any industry and store theft can cost even a modest convenience store more than $150,000 per year. First Line intelligent facial recognition software has been designed by Blue Line’s security engineers and law enforcement experts to provide retail security, prevent retail crime and protect store personnel and patrons. Spiess, a 32-year veteran police officer, leads Blue Line Technology’s team of security experts. The kit comprises three parts: The First Line software, the security appliance station and a server with a network connection. The kit can be scaled to cover multiple entryways in small, large or enterprise scale retail outlets. Please contact us to learn more about First Line’s components. Scan and record the face of every person who approaches any monitored door. People don’t need to pause or even look up for the camera to read their face. Software will send a text or email alert to counter staff or security personnel if a threat is detected. Alerts give you time to react. Depending on the situation, you may decide to greet a shoplifter so they know you are watching, or you may need to call the police. Operators don’t need any computer skills beyond being able to read the text and email alerts. 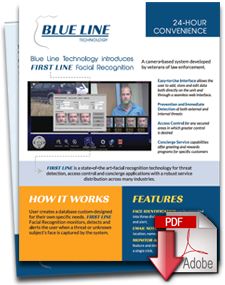 In fact, the built-in intelligence in First Line’s facial recognition system means it does not need to be monitored. 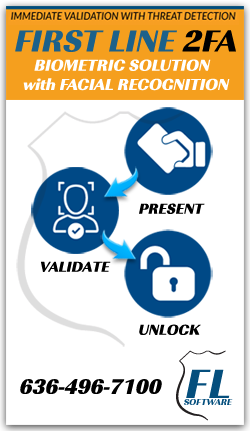 The “Face is The Key” feature is designed to keep doors locked if the security software detects a threat approaching. The threat may be a known shoplifter or a person wearing a mask. Because more than 50 percent of late night crimes are committed by masked individuals, the door won’t unlock if a person’s face is covered. First Line’s outdoor cameras are always placed in clearly visible locations. When people know their face is on video, they are less likely to do harm. Open late because 78 percent of retail crime occurs after 11 p.m. Known to keep cash on the premises. Not heavily staffed and have few customers.